Matudnila.com - A Cebu Events Blog: Cebu Events Blog features Ten Years of Cattski Concert at the Outpost! Home The Outpost Cebu Events Blog features Ten Years of Cattski Concert at the Outpost! Cebu Events Blog features Ten Years of Cattski Concert at the Outpost! 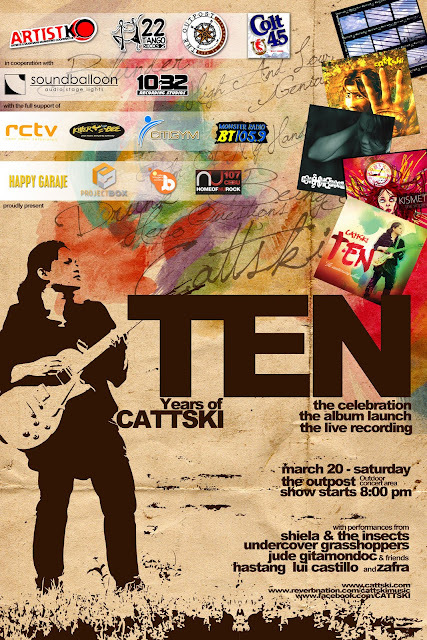 Catch "TEN Years of Cattski" Concert these March 20, 2010, Saturday 8pm at the Outdoor Concert Area, The Outpost. Concert dubbed as Cattski's The Celebration, The Album Launching and The Live Recording. Other performance will be from Sheila and the Insects, Undercover Grasshopers, Jude Gitamondoc & Friends, Hastang Lui Castillo and Zafra. Congratulations and Compliments for Cattski for more than 10 years of Music! 0 comments: on "Cebu Events Blog features Ten Years of Cattski Concert at the Outpost!"